It seems as though we just catch our collective breath from one disaster event when another happens. This week is no exception. Oklahoma is home to NOAA Storm Prediction Center, where experts issued a tornado warning 16 minutes before a tornado (estimated to be EF-4) touched down and moved through Newcastle, Moore and South Oklahoma City. Two elementary schools and hundreds of homes were destroyed. Many people were injured and several lost their lives. The numbers are still being confirmed. It was a tragic day. 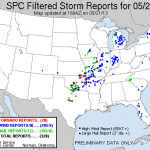 This was the most destructive event of the day, but it was not the only severe weather to hit the country. 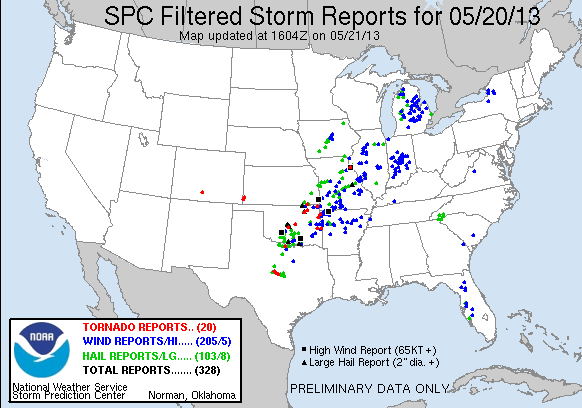 There were 403 preliminary storm reports, including 22 tornado reports, 257 wind reports and 124 hail reports. Today’s forecast is similar to that of yesterday. Other than keep an eye on the forecast and current weather conditions, what can you do to prepare for severe weather? Learn about tornado basics, tornado safety and other related topics on the Storm Prediction Center’s Tornado FAQ. Everyone wants to help and help is always appreciated, but the most appreciated and most helpful thing we can do at this time is to let the responders do their work. While it seems appropriate to drop what you’re doing and head to Moore to help assess damage, move debris and comfort the affected, if you’re not part of an approved organized effort, you are in the way. Do NOT head to Moore unless you’ve been officially requested to go there. You can still help. Make a donation at the National Voluntary Organizations Active in Disasters (VOAD) site or to the voluntary organization of your choice. You can also register on their sites to volunteer.